This is the first film in a two part series. The films stand-alone, but we recommend viewing the films together. $18 discount price when Parts 1 & 2 purchased together. Discount not available at the door. 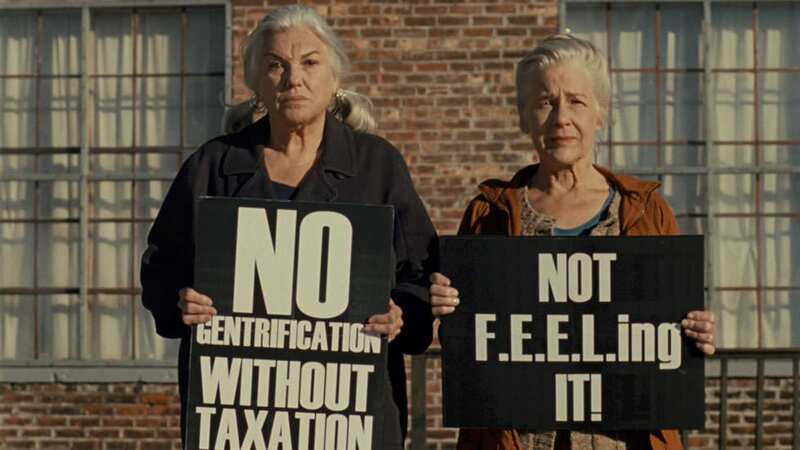 Forty years ago, Dorothea (Tyne Daly) and Greta (Elizabeth Henry-Macari) moved to the town of Checkford and bought an abandoned bread factory. They transformed it into an arts space that hosts movies, plays, dance, and exhibits. It’s where civic groups and immigrant communities can meet, and the site of after-school programs for local kids. Now a celebrity couple—performance artists from China—have come to Checkford and constructed a huge building, the FEEL Institute. Dorothea and Greta learn about a new proposal to give all the funding from the school system for their children’s arts programs to the FEEL Institute. Without this funding, the Bread Factory will not survive. They quickly rally the community to save their space. The commercial forces behind the FEEL Institute fight also, bringing a young movie star to town to help make their case. The school board meeting turns into a circus where the fate of the Bread Factory hangs in the balance.